Well, hooked by the connection to two series I love, the Diana Gabaldon and Sarah Donati ones I thought I’d try this and …Wow! I really don’t know where to start. It was everything promised and more, had me glued to the kindle for hours, smiling, laughing and crying. Its packed with emotion, really deep dark scenes, and high bright ones which made for a perfect read for me. The people felt real, the story so believable. I was pulled into it along with Rebecca and Samuel and the rest of the families. What I loved too is that though this is a trilogy this book is complete in itself, with a proper ending. No horrible, awful, hateful cliffhangers, though I can see – and am hungry for – where the story is going next. 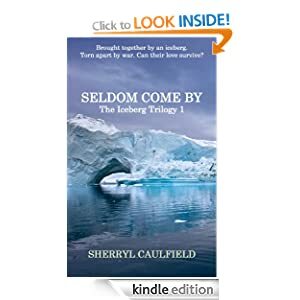 The descriptions of the land and icebergs were incredible- I’ve never seen one, but I felt as if I was there with them in the boat that day under the iceberg arch. The great contrasts in life stories between Rebecca’s home life and Samuel’s was typical of the time period, and I like Samuel I love Rebecca’s enthusiasm for life. I can see too why both her and her sister were so attracted to him. At no time was I able to predict what was gong to happen, it really was a story that kept me on the edge of my seat, and when THAT scene happened – oh the tears I shed – so emotive and such deep dark sadness from it. I feel sad even now just thinking about it. Then there’s Samuel joining his brother in WW1 – I skim read much of the battle scenes, not because they weren’t realistic but because they were, and I have a personal antipathy to war. My grandfather served for Britain in both WW1 and WW2, and would never speak of his experiences, threw his medals in the back of a drawer, and never joined the many reunions held by others. I learned from mum and gran how distraught and shadowed he was by the experiences, it never really left him I think, and that’s affected my attitudes to war so was why I skipped this part. Samuel’s experiences after the war were sadly very, very common, but often misunderstood – he was lucky to have a loving family to let him recover in his own time. My granddad had to come home to a wife and child he’s not seen for years after WW2, having dreaded it because of his experiences of WW1, and I suspect he was just pushed back into the workforce and the need to support his family, and that’s perhaps why he was so reticent about what happened to him. Shut it into the back of his mind, locked away from everyday life. Anyway, its a section that shaped Samuel and Rebecca, was integral to the events that followed, and added yet more to the sadness and happiness balances. Well, not much more I can say except if you love deep, epic, romantic stories this is one for you. Its definitely one to re read too – has so much content that I know I must have missed some, and look forward to discovering even more on second and subsequent readings. I’ve found this before in the very best books, they have details that I find after the first read, bits that add to the story because I know what’s coming, those little hints that are sometimes missed when we don’t know what’s about to occur, or may develop much later in the novel. At £3.14 for 514 pages its a real bargain especially taking into account the re read factor. I’m really looking forward to the next in the series. Stars: After having several four and four and a half star reads recently, I’ve been wondering if maybe I’m too strict about the five star criteria I have, but reading this I know its necessary that there’s something held back for those books that are really, really special. Its a five star read – I just wish I could give more.